In celebration of Arbor Day 2017, Belmont University gathered a group of faculty, staff, senior administrators and students to recognize one of the University’s most recently planted tree, a Sassafras. Vice President of Finance and Operations Steve Lasley led the ceremony and spoke on Belmont’s commitment to sustainability and conservation, as well as the tree’s origins. Native to the eastern United States, the Sassafras is a dark red-brown tree that has many historical uses for its leaves, bark and wood. Native American tribes once used the tree’s leaves to treat wounds, its bark as a flavoring and its wood for fire-starting because of its flammability. Additionally, sassafras was also used in cooking by certain tribes to flavor animal fat, make root bear, create a thickening agent and cure meat, a practice that is still done in the United States. The tree also serves as a host for many butterfly species including the spicebush, tiger swallow-tail, palamades and pale swallow-tail. 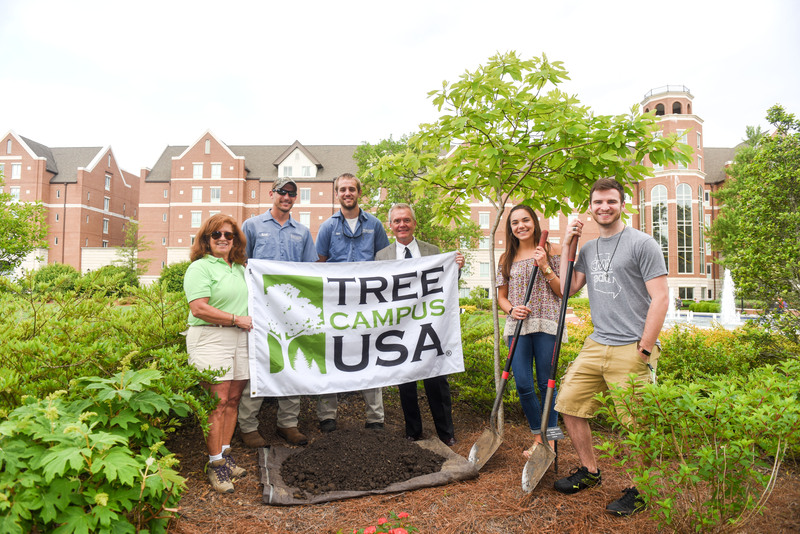 In addition to celebrating Arbor Day, the recognition ceremony was also held in honor of Belmont’s recent designation as a Tree Campus USA by the Arbor Day Foundation, the third time the University has received the honor.